All Glories to Sri Sri Guru and Gauranga! The altar in Chongqing displays a beautiful painting of Sri Sri Guru Gauranga Gandharvika Giridhari painted by Urmala Devi many years ago. We had a most beautiful and auspicious three day celebration in Chongqing, China for Srila Param Guru Maharaj’s, Srila Sridhar Maharaj, Vyasa puja! What can I say? I was completely melted by the sweetness and the earnestness of our devotees there. 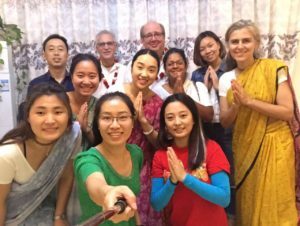 Under Sripad Yudhamanyu Prabhu Seva Vikram’s guidance, they have created a space for sincere seekers to come and present their questions, honor prasadam and have good association! One time when Srila Gurudev, Srila Govinda Maharaj was arriving in Caracas, Venezuela he was driving through the tunnels that take you from the airport to the city and seeing them he said that Srila Swami Maharaj, Srila A.C. Bhaktivedanta Swami Prabhupad, had blasted a tunnel through the western ego, just like the ones we were driving through, and thus allowing him, Srila Gurudev, and so many devotees to go through them to reach the west. While sitting at our Ashram in Chongqing I couldn’t help but remember these words of Gurudev and think that by Sripad Yudamanyu Prabhu’s service and surrender he had also blasted a tunnel in China and now we were all going there to witness the sweetness of our devotees. Srila Gurudev was always so happy with our Chinese mission and it is no wonder when we see how are devotees are carrying on working so hard to have a place to give others some shelter. Local devotees and devotees from around the world came to Chongqing to celebrate the Divine Appearance day of Srila Sridhar Maharaj. 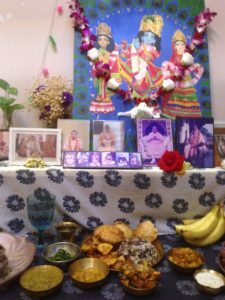 For Vyasa puja day, and with Srila Janardan Maharaj’s guidance, we made aloo dam, a curd subji, sak, mango chutney, dahl, rice, pakoras, fried rice, sweet rice and puris, which were some of Srila Sridhar Maharaj’s favorite preparations. 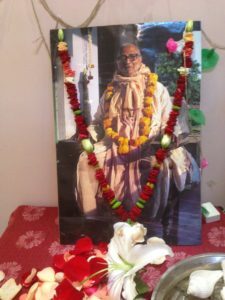 Sripad Yudhamanyu Prabhu spoke of how he had come to the math in the days of Srila Sridhar Maharaj and by Srila Gurudev’s mercy he had gotten some connection. Sripad Hasyapriya Prabhu read a beautiful passage from Srila Guru Maharaj’s biography written by Sripad Sagar Maharaj and Srimati Kelikadambanana didi spoke of how our connection comes through the devotees. Afterwards, everybody offered flower petals to Srila Sridhar Maharaj while we sang Sri Guru Charana Padma. It was indeed very sweet! Throughout our visit many people came to the temple with really sincere questions: How do we practice Krishna Consciousness in our day to day life? What is Bhakti Yoga? What is the best of all yogas? What is the nature of the soul? It is my good fortune to have some connection with our Chongqing Ashram! All glories to our Chinese Mission and our Chinese devotees!